Fans of the pitch can enjoy the latest in Gameloft’s critically-acclaimed Real Soccer franchise. Real Soccer 2010 arrived in the App Store this week with improved graphics, more teams, real players, and new modes—including a highly-anticipated real-time multiplayer feature. Roll on, Rossoneri: Things are rocking at the San Siro as Andrea Pirlo leads AC Milan to another famous victory in Real Soccer 2010. The latest version offers more leagues and teams as well as real players’ names. Real Soccer 2010’s new content is sure to please new and old fans of the series. In the previous edition of the game, you could play as your favorite English premier league team in its journey to supremacy or vie for honors on the international stage by commanding the best national teams in the world. 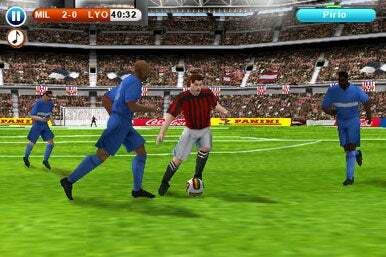 Real Soccer 2010 now offers eight leagues, 245 teams, and real players’ names thanks to a FIFPro licensing agreement Gameloft has secured with the worldwide representative organization for professional footie players. So when you select Real Madrid, you can expect to see its talent-heavy lineup rendered in remarkable detail and accuracy. Gameloft has taken special care to ensure that not only are the teams diverse and accurate, but the entire game experience is more true to life. There are now 14 different stadiums to play in and you’ll hear commentary during the match to make it feel like you’re there. In addition to playing an entire season as your favorite team or guiding your team to victory in a specific cup, players can now assume the role of their favorite player for the entire game or manage a team throughout a season with trades. “Enter the Legend” mode will allow you to play as a single player for not only a single game, but for an entire season—effectively allowing you to have detailed control over the fate, development, and fame of your player. While you’ll likely spend a significant amount of time waiting for your teammates to pass you the ball, the personalized aspect will surely appeal to some dedicated fans. Aside from the significant single player upgrades, the new social and multiplayer aspects should provide an added dimension to the gameplay. Players can compare their performance against others on an online leaderboard and can upload their best replays directly to YouTube, letting others see their skills. You can also get the latest soccer scores through a soccer RSS feed through the game’s main menu. But most important, Real Soccer 2010 has promised real-time multiplayer capabilities. Both Wi-Fi and Bluetooth multiplayer abilities are in the works, allowing you to play online or locally. You can also take part in “Gameloft Live!” official matches to improve your ranking. Fans of Real Soccer 2009 will also appreciate that Gameloft didn’t rest on its laurels but instead chose to improve gameplay aspects from the previous edition. In addition to graphics upgrades, the directional pad has been improved—you can now select your player by simply touching him on the screen. This is especially important when playing on defense; simply cycling players often proved clumsy and directly selecting the defender you want to use will hopefully be a much more efficient mechanism. Real Soccer 2009 was one of the most popular and critically acclaimed sports games for the iPhone last year. At first glance, Gameloft seems to have passed on making superficial upgrades in favor of laying the groundwork for creating a game that can take advantage of the iPhone’s capabilities in a way no other sports game has done so far. Real Soccer 2010 looks to be not only a worthy sequel, but a game that will raise the bar for iPhone sports games across the industry. Real Soccer 2010 is available in the app store for $7. The game runs on the iPhone 2.2.1 software update.